Posted on August 23, 2018 by Gil Klein	in Achiever Magazine, News and tagged Current Students, Education & Teaching, Faculty, Prospective Students. 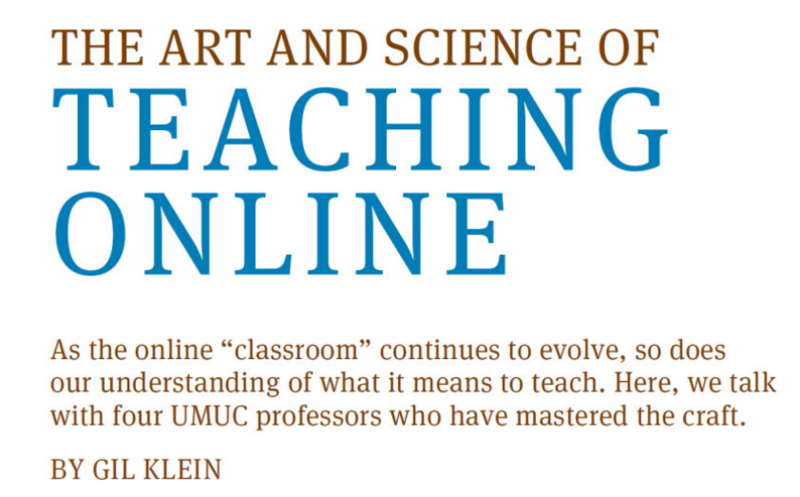 With student demographics shifting and the internet at our fingertips, UMUC faculty discuss what it means to teach and how the role of the teacher is evolving in the 21st century. Editor’s note: This article is featured in the Spring 2018 edition of Achiever, the magazine of University of Maryland University College. Posted on August 14, 2018 by Bob Ludwig	in News, Press Releases and tagged Alumni, Current Students, Featured, Media, Military, Prospective Students, Veterans. Posted on May 25, 2018 by UMUC	in Events, National Military Appreciation Month, News and tagged Alumni, Current Students, Featured, Military, News, Prospective Students, Staff, Veterans. Posted on May 2, 2018 by Carole Mahoney	in Events, News and tagged Alumni, Current Students, Cybersecurity, Military, Prospective Students, Veterans.